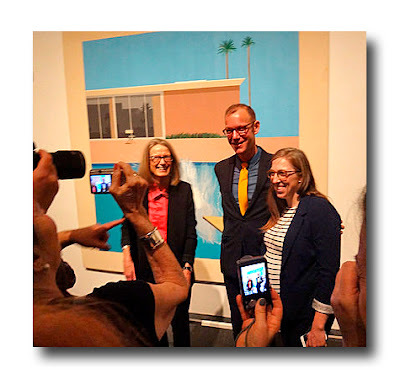 Yesterday I attended a press preview for Hockney's upcoming exhibition (November 27 - February 25, 2018) at The Met Museum. This is to be the only North American venue for the exhibition (the last Hockney exhibition was in 1988), which has already traveled from the Tate Britain, London and, most recently, the Centre Pompidou in Paris. 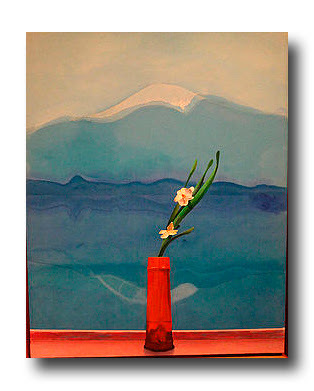 It also marks the homecoming of two of his major paintings including "Mt. Fuji and Flowers" (1972) which is apparently the Museum's best selling postcard -- outselling Monet, Van Gogh and even The Met's famed Christmas tree. 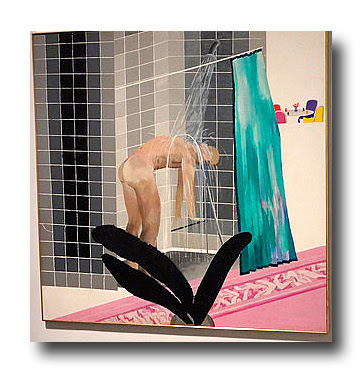 This retrospective of Hockney's career encompasses works from 1960 to the present. 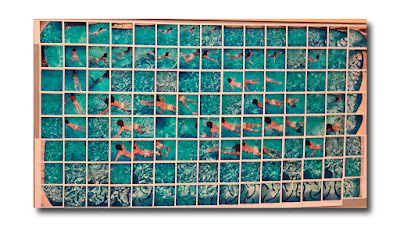 It fills eight rooms or galleries, mostly in chronological order, spanning from the graphic, often homosexuality themed paintings of his days at the Royal College of Art in London to his relocation in 1963 to Southern California, a place that lived up to his fantasies with its rolling hills, backyards and swimming pools. 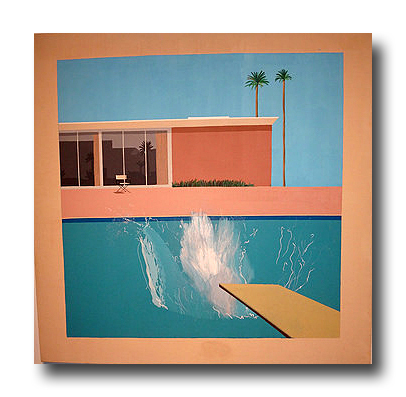 Of his 1967 painting "A Lawn Being Sprinkled" he remarked "In LA the rain comes from the ground." Large Interior, Los Angeles, 1988. A few Picasso inspired cubist works are here in the shape of medical and office buildings while Hockney's famed life-sized double portraits including one of Celia Birtwell and Designer Ossie Clark are on view in the next room. There are line drawing portraits of his mother and father, his boyfriends, Andy Warhol, and others. 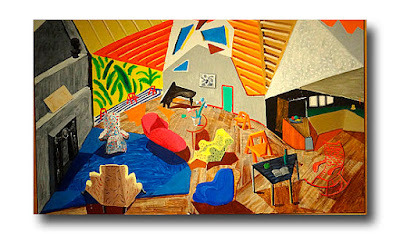 Many of his earlier paintings have curtains in the foreground, alluding to his time spent designing theater sets. 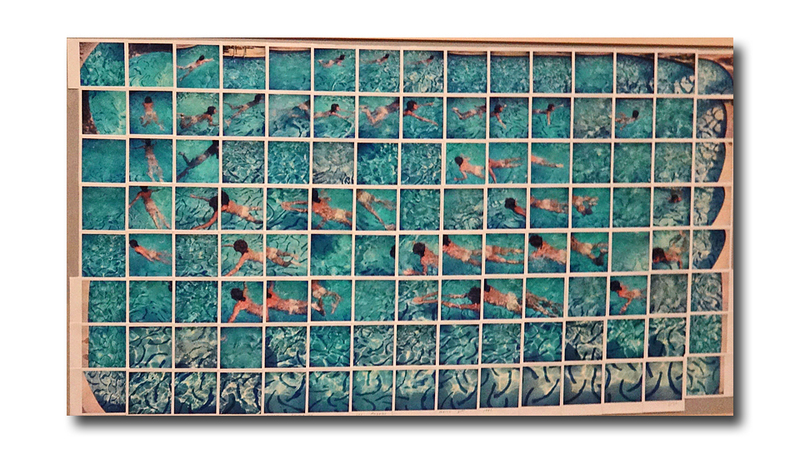 A small number of photographs are shown including his individual Polaroids arranged in collage compositions to form "Gregory Swimming," (Los Angeles, March 31st, 1982) as well as a photo collage of his mother sitting among the ruins at Bolton Abbey. 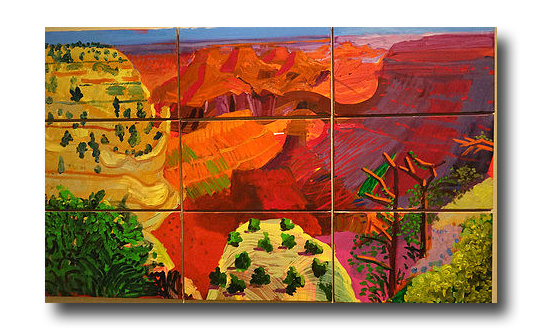 A room of mural sized landscapes include his stylized, colorized vision of the Grand Canyon which he would often drive through on his way West, and a winter view of "The Tunnel" near his studio in Bridlington, Yorkshire. 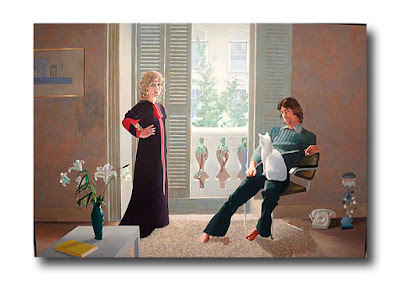 As is evident here, Hockney doesn't believe that rules should govern artistic freedom. 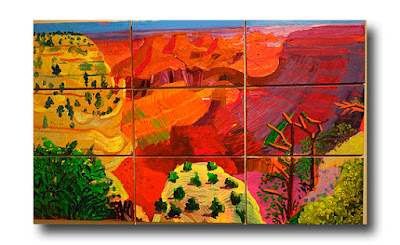 He is quoted as having said that "there are no borders when it comes to painting -- no frontiers just art." Curator Ian Alteveer spoke briefly of Hockney's many artistic influences including Matisse, Van Gogh, Fauvre, Picasso, Chinese scrolls and, in particular, Fra Angelico's 15th century work "The Annunciation, which looks to me like it could have influenced his double portraits. Bringing this exhibition full circle back to The Met, is a 1968-9 double or pairs portrait depicting then Met Modern and Contemporary Art Curator Henry Geldzahler and his then partner, painter Christopher Scott. Geldzahler was known to befriend many of the artists of the day and was even a subject of a 1964 Andy Warhol silent film in which he smoked a cigar for 97 minutes while becoming increasingly agitated. 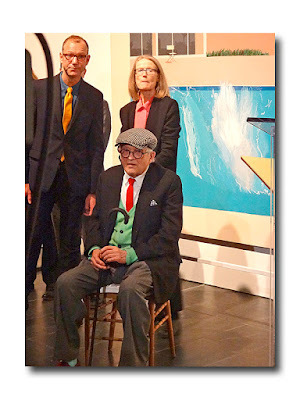 About halfway through the speeches I realized that David Hockney himself, a nattily dressed older gentleman, was in attendance. Fashion conscious from way back in the '60s when he wore a gold lamé jacket to receive a medal, he was regularly photographed as part of the swinging London scene, often making the pages of the new celebrity glossies. "I'd like to say that it's a marvelous exhibition," said Hockney. "I want my work to be seen -- I don't have to be seen. Thank you very much." Lest you think that an 80-year-old would not be up on new technology, the last gallery proves you wrong. 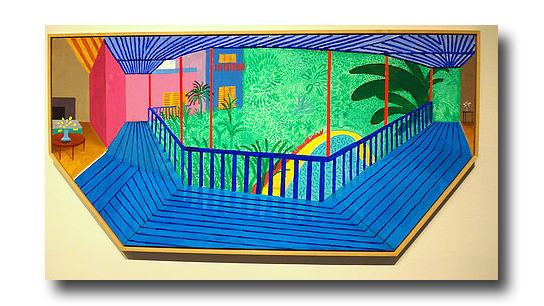 Hockney had embraced the iPad in the early 2000's using it to draw what he saw looking out his bedroom window while in Bridlington. Those sketches can be seen here as they automatically scroll through to display "Views through the Artist's Bedroom Window, Bridlington. "During the summer of 2013, Hockney moved back to his Hollywood Hills home which he had decorated in living color back in the 1980's. The cobalt blue decking, bright pink stucco wall combined with the bright green grass make a striking composition for an artist who is still going strong and staying true to his roots. Afterwards, I couldn't resist a brief nip next door. The Michelangelo exhibition was very crowded so I quickly snaked my way through the galleries containing many figurative drawings and a few sculptures. 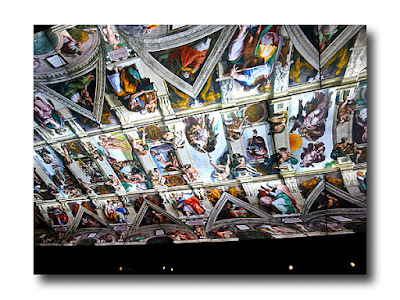 Finally, I looked up and was rewarded with this recreation of a section of the Sistine Chapel.